"Start Here is an urgent and timely primer on the approaches that are working and don't require federal approval or political revolution to end one of the most pressing justice issues the country faces today." Everyone knows that the United States leads the world in incarceration, and that our political process is gridlocked. What can be done right now to reduce the number of people sent to jail and prison? This essential book offers a concrete roadmap for both professionals and general readers who want to move from analysis to action. In this forward-looking, next-generation criminal justice reform book, Greg Berman and Julian Adler of the Center for Court Innovation highlight the key lessons from these programs--engaging the public in preventing crime, treating all defendants with dignity and respect, and linking people to effective community-based interventions rather than locking them up. Along the way, they tell a series of gripping stories, highlighting gang members who have gotten their lives back on track, judges who are transforming their courtrooms, and reformers around the country who are rethinking what justice looks like. While Start Here offers no silver bullets, it does put forth a suite of proven reforms--from alternatives to bail to diversion programs for mentally ill defendants--that will improve the lives of thousands of people right now. 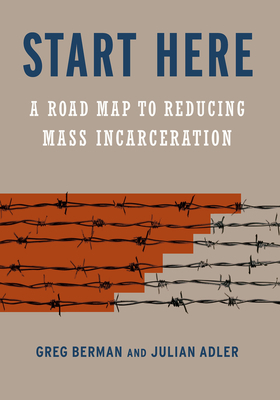 Start Here is a must-read for everyone who wants to start dismantling mass incarceration without waiting for a revolution or permission. Proceeds from the book will support the Center for Court Innovation's reform efforts. Julian Adler is the director of policy and research at the Center for Court Innovation. He was previously the director of the Red Hook Community Justice Center and the lead planner of Brooklyn Justice Initiatives. He was also part of a small planning team that launched Newark Community Solutions.